Peanut Butter Cup Dessert Pizza has a crust made from refrigerated cookie dough covered by a layer of chocolate, and a peanut butter cream cheese layer. On top, lots of chopped peanut butter cups and peanut M&M’s. This dessert pizza has tons of peanut butter and chocolate flavor! 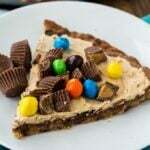 Peanut Butter Cup Dessert Pizza is a cinch to make. You start with refrigerated peanut butter cookie dough. You can either use the kind that comes in a tube or the kind that comes on a tray and is cut into pull apart pieces. Instead of peanut butter cookie dough, try using peanut butter cookie dough with chocolate chips if you can find it. Press the cookie dough all along the bottom of a 12 to 14-inch pizza pan so that it forms an even, continuous layer. Bake it until it starts to get crispy. Then immediately sprinkle 1 cup of chocolate chips on top. Once they start to melt, spread them into a thin, even layer. Place the pizza in the fridge for a few minutes so the chocolate sets up. Next use an electric mixer to beat a block of cream cheese, some peanut butter, brown sugar, and vanilla until smooth. This creamy peanut butter mixture gets spread on top of the chocolate layer. 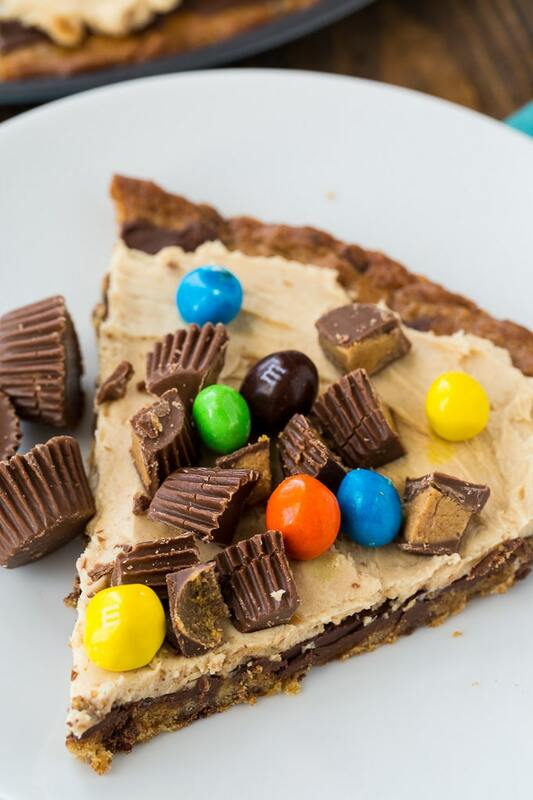 Lots of chopped peanut butter cups and Peanut M&M’s finish off this amazing dessert pizza. 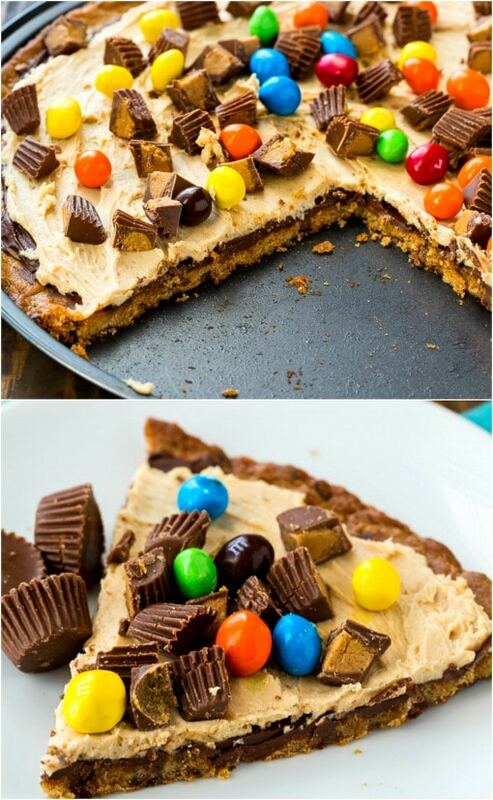 Peanut Butter Dessert Pizza is best eaten soon after making. Leftovers need to be refrigerated because of the cream cheese. Leftovers can be reheated briefly in the microwave to get everything a little soft and melty. 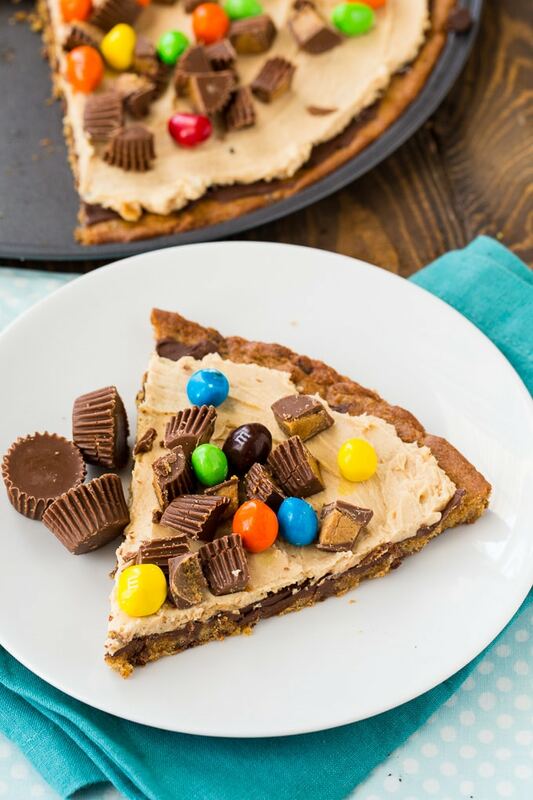 Peanut Butter Cup Dessert Pizza has a crust made from refrigerated cookie dough covered by a layer of chocolate, and a peanut butter cream cheese layer. On top, lots of chopped peanut butter cups and peanut M&M's. 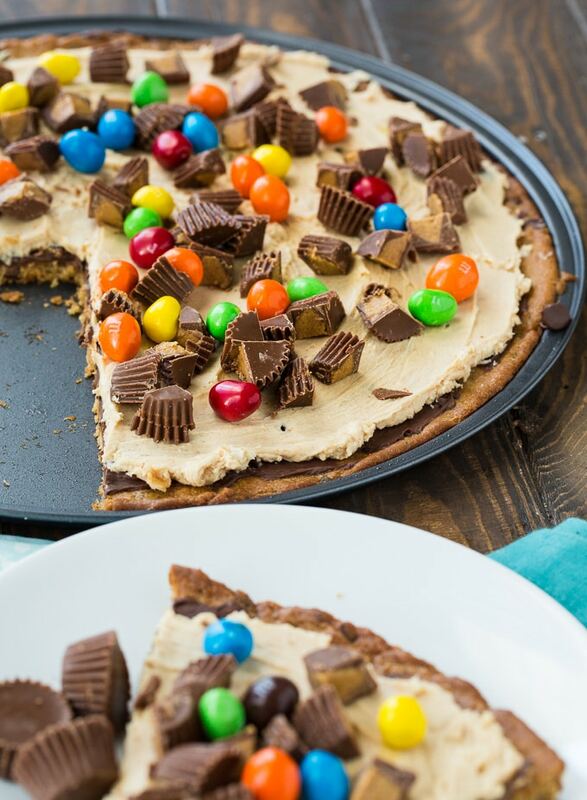 This dessert pizza has tons of peanut butter and chocolate flavor! Press cookie dough onto a greased 12 to 14-inch pizza pan. Bake in a 350 degree oven for 12 to 16 minutes. Immediately after removing from oven, scatter the chocolate chips on top. Let sit for 1 minute to melt, and then use a knife to spread the chocolate chips into an even layer of chocolate. Place in refrigerator for 10 minutes to firm up. Using an electric mixer, beat cream cheese, peanut butter, brown sugar, and vanilla until smooth. Spread over chocolate layer. Sprinkle the chopped peanut butter cups and peanut M&M's on top. Store in refrigerator. This entry was posted in Desserts and tagged chocolate, Peanut butter. Bookmark the permalink.